Muslims pray towards the Ka'aba/?????? (the cube) in Mecca no mater where they are in the world. Historically, the site has housed relics from when Saudi Arabia was ruled by waring clans. 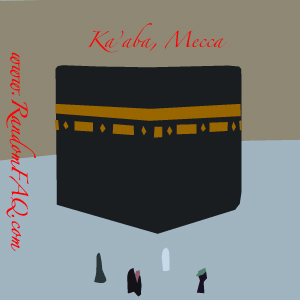 The ka'aba itself was a symbol of trade, uniting the clans with a common crossroad. A hajj is a pilgrimage to Mecca and a right of passage to many muslims. Although believed to be a gift from allah, built by Abraham; a Hindu inscription was found on the inside of the structure. The haram or Muslim-only area around the cube can stretch as far as 12 miles.